Manali – How to Plan your Trip and Explore? If one was to name the most visited tourist spots of not just Himachal Pradesh but all of our country, then I am sure that the name Manali would definitely be on top of that list. It is one of the few places where tourist season remains throughout the year. There are months when the number of people visiting goes up; but on a general basis, tourists in Manali are always present. And I am not talking about just a handful of people but enough to keep the tourism industry thriving here throughout the year. From a family on vacation; to a group of friends out for some fun; Manali is the hot favorite destination for a wide range of people. What makes Manali so special and how you can go about planning your trip here; is what I will be discussing in this article. Often referred to as the “Queen of Hills”, Manali is located at an altitude of nearly 2050 meters in Kullu district of Himachal Pradesh. Surrounded by high peaks in the beautiful green Beas valley; Manali is blessed with breathtaking natural beauty all around. Majestic snow-capped peaks, thick forests, fruit orchards, beautiful hamlets and meadows carpeted with lovely wild flowers make it an ideal destination for honeymooners. So popular Manali has become in last few years that there are over 1000 hotels and guest houses in this small town; and still if you went here in peak tourist season, you may have trouble finding a place to stay. It is probably the only hill station in Himachal where you will even find families visiting from southern parts of India. There are several things that make Manali an year-round destination. What it presents is a mix of activities that cater adventure junkies, families and backpackers alike. Why you Should visit Manali? It is a hub of adventure activities like skiing, paragliding, trekking, mountaineering and rafting. In summer, people arrive here to escape the scorching heats of the plains; in monsoon, it is the lush green of the hills; and in winter it is the snow all around and the hope of catching a live snowfall that gets people to pack their bags and arrive at Manali. For the spiritual types, a visit to Hadimba Temple, Vashisth Bath, Van Vihar and Manikaran Sahib presents a perfect reason to visit Manali. But more than a long list of places to visit and activities to do, an even bigger reason for people to come here is of connectivity and safety. Fact cannot be denied that when you are out with family; with ladies and your kids; you want to go to a place that can be considered safe. Being a tourist hub and always filled with people, Manali then becomes the destination where you can safely bring your folks and let everyone enjoy to the fullest. The road from Chandigarh to Manali can be called smooth if not excellent. It is about 2540 kilometers of mountain roads but still remains in good condition. Mobile, phones and internet connectivity in Manali is excellent and you always remain connected. Manali, as I stated above is open for tourism all year long. Best time to visit Manali will differ for every individual and really depends on what is it that you are looking for exactly. If you want to catch a live snowfall then January will be the best time to head to Manali. For snow related sports like skiing, the month of February will be the best. If you just like cold weather in general, then you can come to Manali anytime between November to February. For someone who is interested in activities like paragliding, rafting and mountain sports, the months from March till June will be the best. The best time to visit Manali overall in my opinion are the months of September and October when monsoon retreats and the entire valley is lush green. This is the time when you will witness the true beauty of the hills around. Weather too at this time is very pleasant with summer gone and winter yet to arrive. A good time to avoid going to Manali would be during holidays. This is the time when a lot of people head towards Kullu and Manali and the entire area is flooded with tourists. A friend of mine once described Manali Mall road as “Azadpur Sabzi Mandi” and that is how crowded it can get during holiday season. Best would be to take some time off work and then plan your trip and avoid the regular holiday times. Manali is a very well connected town and it remains so throughout the year. You can reach here either road, train or flight. Bhuntar, which is about 50 kilometers from Manali is the nearest airport. There are regular flights by Air India, IndiGo and SpiceJet from both Delhi and Chandigarh to Bhuntar. Once you land here, you can board a taxi from the airport to your hotel in Manali. Apart from Bhuntar, the nearest airport is at Chandigarh but it can take up to 6 to 8 hours from Chandigarh airport to reach Manali. Almost all major airlines have flights operating from Chandigarh to other cities. If you wanted to reach here by Train, the nearest railroad will be the narrow gauge track up to Jogindernagar. Major nearby railway station however would be at Chandigarh. Best way to reach Manali however is by road. The 300 kilometers long stretch between Chandigarh and Manali remains open throughout the year and is mostly in good condition. The hilly region starts after Kiratpur Sahib and the entire drive is quite a scenic one. If you were living too far away then you can reach Chandigarh by air or train;andd then either rent a private taxi to Manali or board a bus. There are regular buses operated by HRTC; both luxury and ordinary; to Manali from all major cities nearby. Starting from Delhi, the entire stretch till Manali remains in good condition. Until Chandigarh, it is NH1 which is a smooth drive. Getting through Chandigarh however can sometimes take a bit of time if you reached here during peak traffic hours. After Chandigarh, road is again good until Kiratpur Sahib. Once the hilly region starts, road will turn bad for initial few kilometers but then remains a mix of average and good until Manali. There is really no best vehicle as such for visiting Manali. No matter which car you have, as long as it is well maintained, you can bring it to Manali. As a matter of fact, local taxi drivers here take tourists use Alto and take tourists to Rohtang pass in it. So yes, even your small hatchback will be fine for Manali trip. There is no local transport within the city of Manali. For moving around in the town or places nearby, you will either have to rent a private taxi or wait for a shared cab. Problem however is that private taxis in Manali can really cost you a lot of money and cannot be considered a budget option. Shared taxis on the other hand is not a guaranteed deal and you may not find a shared cab going towards your destination at all. Thus the best way to commute within Manali would be to rent a two wheeler; either a motorcycle or an automated scooter. There are several rental agencies and mechanics in Manali that offer these vehicles on rent and you will have no trouble locating one. Manali is one of the most visited hill stations of our country; and tourists here comprise of both budget travelers and people who are looking for a luxurious vacation. Similarly, there are hotels here that cater to both. There are over 1000 hotels and guest houses in Manali so finding a place to stay will not be a big deal at all. Depending upon your preference, you can stay at any of the luxurious resorts or look for a budget accommodation which can be for as low as Rs. 700 – Rs. 800, depending upon your negotiation skills. At an average however, plan your trip keeping Rs. 1200 as your minimum room rent per day. Whether or not to book in advance is entirely a personal choice. I am more of a person who likes to first walk around a bit, see the location of the hotel and the condition of the rooms before deciding to check in. So I have never ever booked a hotel in Manali and have always decided to finalize it after my arrival here. This also gave me the choice of negotiating the price down a bit. However this also meant the hassle of walking around looking for a place to stay with a risk of not finding one at all in peak tourist season. Not finding a hotel at all however is a far off probability. But if you are someone who would rather have the peace of mind then you may choose to book your stay in advance. The natural beauty of the place will definitely be on top of this list. Be it the summer or peak winters, Manali presents a different color in every season and is a feast for the eyes. With that being said, some places however can still be termed as prime attraction of the trip. Below is a list of some such places in Manali which are definitely worth a visit. This is by far the biggest tourist attraction in Manali. With snow covered hills all around, Rohtang Pass is nature’s beauty at its best and Rahala Waterfall on the way add even more to it. People come here from far off to witness snow even in the months of June and July. There is also a wide-range of adventure sports available here like skiing, snow scooter, etc. It is a wood-and-stone temple, constructed in 1553 and dedicated to Hadimba, the demon wife of the Bheem. There is also a sacred tree near the temple and Ghatothkach, the son of Hadimba and Bheem, is worshiped in the form of this tree. Apart from its lush green natural beauty, apple orchards, lakes, and snowcapped peaks; Solang valley is also famous for its adventure sports. Out here, you can indulge in paragliding, zorbing, skiing, parachuting, etc. If you reached Solang valley in winter, you will find the entire place turned into a ski-resort where you can try your hand at skiing. You can also try a ride on the ropeway, which allows a 360-degree view of the valley around. This located is located about 6 kilometers from Gulaba and you will have to trek to reach here. It is named after Bhrigu who is said to have meditated here. The legend has it that gods used to take a dip in the waters of this lake due to which it is also known as “the lake of Gods”. It is said that this lake never freezes completely. This cold water natural spring is named after Pandit Jawaharlal Nehru who used to drink water from this spring while visiting Manali. It is located about 5 kilometers from Manali. This spring is fed by the water from Bhrigu Lake. Also Read: How to Plan a Trip to Sangla Valley? Located about 80 kilometers from Manali is the small town of Manikaran which considered sacred by both Hindus and Sikhs. There are several temples and a Gurudwara here. The place is also famous for its hot water spring. There are a few hotels at Manikaran so you can arrive here from Manali and can even stay for the night. This hot water spring is located at about 3 kilometers from Manali and is a popular tourist destination. The water of this spring is said to have medicinal properties. Bathing arrangement for visitors has been made in form of Turkish style showers. Below is a list of activities that you can indulge yourself in while visiting Shimla. Manali is a hub of several tourist related activities and you can spend days without getting enough of it. The list below is of activities that you can do apart from visiting all the above mentioned places. Rafting is one of the biggest adventure activities that takes place in Manali. So popular and sought after it is that you will find the entire drive from Kullu to Manali filled with locals with their hoarding up offering rafting packages. Depending on the total distance covered and number of people, it can cost you anywhere between Rs. 1000 to Rs. 2000 per person, depending upon your negotiation skills. If you are however slightly inclined towards adventure sports, then you must try white water rafting in Manali. This is the second most popular tourist activity in Manali that happens all year long. If you were visiting in winters, in the months of January and February to be precise, then there are several places in Solang valley where you can go skiing. 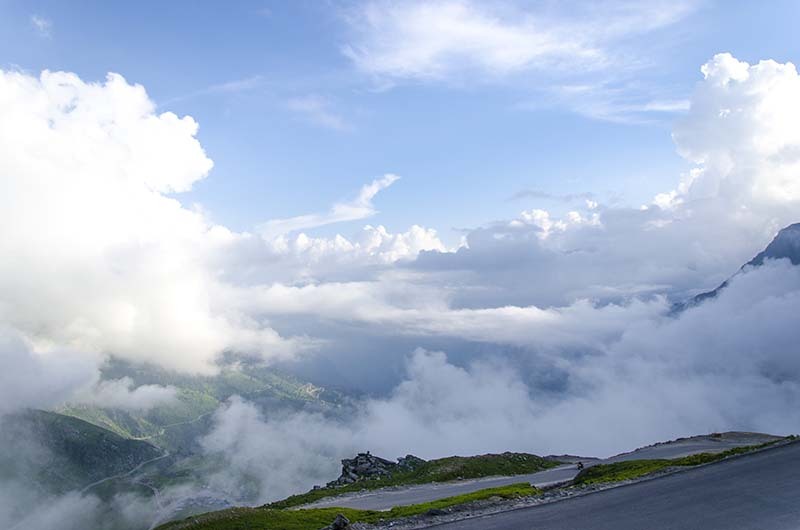 In summer however, it is pretty much limited to the top of Rohtang Pass. Soar above the valleys like an eagle and get view of the lush green hills around like never before. Not matter how many times you experience this thrill again, you will never ever forget the first time you went paragliding. It is an amazing experience and a must for everyone visiting Manali. Also Read: How to Plan a Trip to Prashar Lake? If you want to spend some time away from the regular town life and people around, then going for camping for a few days will be a perfect activity for you. There are several treks from Manali like Hampta Pass where you can take a walk through the lush green hills and sleep in the tents. The Treks in and around Manali varies from one day hikes to five day treks. Apart from Hampta Pass, some other major treks are Bhrigu Lake, Chandrakhani, Chandra Taal and several others. Zorbing is a one-of-its-kind adventure sport wherein a person is slid into a huge transparent plastic zorb ball which is then rolled down a mountain slope. The weather of Manali is that of a typical hill station. Being located in the very close vicinity to the snow line, it is mostly pleasant and soothing during summers and extreme cold during the winters. The monsoons are enjoyable though the heavy rainfall can damage the roads and cause landslides. The temperature during the summer months of March to June varies from 10°C to 25°C and during the winter months of October to January, the temperature can even fall to -1°C. If you were visiting here in summer, then your regular cottons will do just fine. If however you are planning to travel to go to Manali during winters, do carry enough woolens to keep you warm. The temperature of the rainy months of July and September nestles around 7°C to 10°C. During monsoon, it can rain here non-stop so please make sure that you are bringing proper rain gear to keep you dry. Hindi is the official and most spoken language in Manali. Himachali or Pahadi too is spoken among the locals. If however you were not familiar with either of these two, even then you will not face any problem as people related to Tourism industry are well verse in English. Both government and private deluxe and Volvo buses are available from Delhi but you need to book these two to five days in advance. I hope the information above on visiting Manali was of help. If you have any further questions; or need any further details; please feel free to ask in the comments section below; or at our Community Forum; and I will be glad to answer.